"Macross" first aired in Japan in 1982. 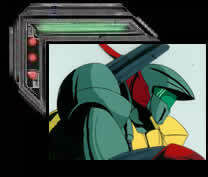 Carl Macek took "Macross" and combined it with two separate series, "Super Dimensional Cavalry Southern Cross", and "Genesis Climber MOSPEADA", to create "Robotech". "Robotech" aired in the US in 1985. There is also a Macross movie, "Do You Remember Love", from 1984. None of its footage was used in the Robotech TV series, but some of the cels below are from it. An alien space ship crash lands on Earth, so the nations of Earth make peace, and invest in repairing the ship. After ten years, when it’s completed, they christen the ship the SDF-1 (The Self Defense, uh, sorry, Super Dimensional Fortress One). Immediately, they are attacked by an alien race called the Zentradi/Zentrani and, due to an accident, the ship is warped to the other side of the solar system. The series follows Rick Hunter/Hikaru, the love sick pilot, who, when not flying a super cool robot transforming plane, must decide who he loves more: Japanese idol singer Minmay, or career woman Lisa/Misa.